"Gipsy" Smith was one of the world's great evangelists, the Billy Graham of his day. Born in Britain, he came to Chicago in October of 1909 for a month of revivals at the Seventh Regiment Armory, on Wentworth Ave., between 33rd and 35th, pictured above. At the time, the Armory was the largest convention space in the city, with capacity above 15,000. Built in 1907 for $500,000 to house the heavily-Irish seventh regiment, it had hosted the 1908 Republican National Convention, where William Taft was nominated. His Democratic rival, William Jennings Bryan, and the Socialist candidate Eugene V. Debs, also spoke to large crowds at the Armory that year. The building sported a dome-shaped roof with no major supports or columns in the middle to interrupt the wide floor space. The Armory also had a sophisticated heating system that kept the cavernous space comfortable through Chicago winters. Gipsy Smith's most famous sermon took place on the evening of October 18, 1909. On that night, after the sermon, the Methodist preacher led a force of over 2,000 Christians into the Levee, Chicago's segregated vice district, where they marched, prayed, and sang hymns to the interest and amusement of more than 30,000 onlookers. Chicago police, politicians, and even other men of the cloth had warned Smith against the march, arguing that it would only raise interest in the red light district, and introduce its charms to those who otherwise would have no interest in visiting. Yet Gipsy persisted. In his sermon that night, he recalled the Savior's fearlessness in handling sin, his willingness to go to the sick at the pool of Bethesda, to touch the leper, and to speak with the Magdalene. He concluded with a pointed attack on his critics as modern-day Pharisees. Then, his listeners poured out onto 34th Street, walked the mile and a half up State Street to 22nd, then turned up Dearborn. The march started poorly when Gipsy Smith realized he had left his Bible back at the Armory. The crowd slowed while a runner retrieved the book. When they arrived in the Levee, the crowd stopped at the Everleigh house and sang hymns, accompanied by the Salvation Army band. They recited the Lord's Prayer and the 91st Psalm in front of saloons, brothels, and gambling houses, all of which had dimmed their lights and shut their doors fast at the urging of the police. No stranger crowd ever assembled in Chicago than that which packed the South side levee last night....Quietly, orderly, singing plaintively, with and without the music of the Salvation Army bands, two or three thousand people in deadly earnest walked through the streets of shame lined by the darkened windows and closed doors of the brothels and the mansions of prostitution....Men and women were on top of buildings, in wagons and automobiles, leaning from windows, and occupying every possible position of vantage. But all were silent -- respectfully, or sardonically so. Many slumming parties took the opportunity to visit the Levee for the first time. In Dearborn street a group of four unescorted women, two of them carrying babies in their arms, walked slowly along and inspected the individual resorts with curious eyes. One of the babies fretted because it could not have the "pitty glass" in a doorway that glittered in the electric light. Automobiles filled with respectable appearing men and women chugged slowly through Dearborn street and Armour avenue by the dozen for hours before the parade. Gipsy Smith (pictured below) ended his tour at the Alhambra theater on State at Archer, where a burlesque show had ended not an hour earlier. His crowd of Christian "missionaries" held a midnight revival there before dispersing. After the parade was over the district awakened to find the biggest business of its recent history waiting at the doors clamoring for admission. Even before the last of Gipsy Smith's followers had marched sturdily out of Armour Avenue the doors of the resorts were flung open and the crowds began to pour in where the lights were bright and where music -- not sacred -- was abundant. The resort keepers themselves were astonished at the rush of business that almost swept them from their feet. They had prepared for some additional trade. They had stocked up their ice boxes with more beer and had put in an extra piano player or two. But all of these preparations were inadequate. The crowd simply swamped the resorts, and for a time the scene resembled a country fair in full blast. Despite the apparent short-term failure of the march, it was the first strike against segregated vice in Chicago, and it raised awareness of the ongoings on the South side. Chicago churches kept up the political pressure on the Mayor to shut down the Levee even after Smith left in November, 1909. By 1911, the Everleigh Club was closed by the city, and within a few years, open vice was at an end in Chicago. 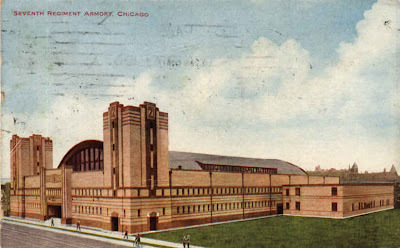 The Armory continued to host major sporting events, auto shows, and conventions. It was the base for thousands of Illinois guardsmen during the 1919 race riots. Today, the site where Gipsy Smith began the public crusade against the Levee is the north parking lot for U.S. Cellular Field (also known as New Comiskey), home of the American League's Chicago White Sox. Gipsy Rodney Smith Sr., was the best-loved evangelists from the early 19th & 20th Century. He didn't preach politics, but Jesus. His eldest son, Albany said of him, He knew of no other man that lived as close to Jesus and that he lived in an atmosphere of prayer. We need some preachers that are like that today. Did you know that you can shorten your long links with Shortest and earn $$$$ from every visit to your short urls.